St. John's Church was founded in October of 1891 by German farmers who had immigrated to Woodland, CA. At it's founding, the church was a member of the German Evangelical Synod of North America, which merged with then German Reformed Church in United States in 1934. That same year, St. John's original sanctuary (left) burned down in a fire that began at Woodland's local brewery. The congregation was devastated at the loss of their place of worship. But they were also determined to continue as a family of faith and worship in Woodland. Within a year, money was raised, and the new church building was erected (right). To this day, St. John's worships in the rebuilt sanctuary from 1935. 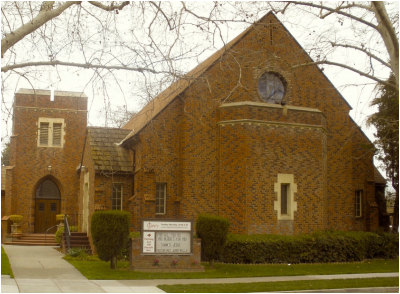 In 1957 the Evangelical & Reformed Church formed a union with the Congregationalist and Christian Churches to form the United Church of Christ (below), officially establishing our congregation as St. John's United Church of Christ. In these last 60 years, St. John's has been committed to its call to service in Woodland, establishing and serving within a number of the city's local ministries. Our membership participated in the founding of Woodland Ecumenical Ministries, and is the founding organization of St. John's Retirement Village, in addition to our history of service in and through a number of other ministries in town. of Christians that come together as one church to join faith and action. the UCC serves God in the co-creation of a just and sustainable world. church where,"…they may all be one" (John 17:21).